TAIPEI, Taiwan, June 7, 2015 (ENS) – Prime farmland is being lost to development across Taiwan, posing threats of food shortages and environmental pollution and causing farmland prices to soar. To keep farmland for agriculture, rules that limit purchase or construction of farmhouses to farmers could take effect as early as June 30, says Taiwan’s Council of Agriculture. The goal of the draft regulations is to make sure that “farmlands are reserved for agricultural uses,” says the COA Minister Chen Bao-ji. The rules are moving forward despite that fact that some lawmakers opposed to them have exerted pressure on Cabinet-level officials. Under the proposed rules, people applying to build farmhouses will be required to show National Health Insurance, NHI, registration under Category 3 designated for farmers, fishermen and irrigation associations, or people buying farmers’ insurance or engaging in farm activities, says Minister Chen. The only group not subject to these restrictions will be inheritors. Council of Agriculture data shows that in the period 2008 to 2013, only 38.8 percent of the 16,338 people who applied for permission to construct buildings for agricultural purposes had NHI Category 3 status. The new rules also mandate that farmland development be limited to no more than one-10th of the arable land on the property. COA aims to address farmland speculation by eliminating regulatory loopholes that allow people to develop farmland under the guise of building agricultural dwellings. Speculation has led to soaring farmland prices and has deterred self-supporting young people from working as farmers, Chen told the legislature’s Economics Committee in Taipei. According to legislators, farmland in Taiwan is NT$15 million (US$485,000) per hectare, a value five times higher than equivalent land in Japan. The main cause of today’s speculation is a 2000 amendment to the Agricultural Development Act that the Taiwanese government used to lift a ban that restricted farmland to agricultural use, points out The Taiwan Rural Front, an NGO supporting land and farmers’ rights. That amendment allowed architectural structures to be built on farmlands that exceed 0.25 hectares in size, opening the door to free market purchase of agricultural land. Today, the majority of farmhouse owners (61.2 percent) are not farmers. Hundreds of thousands of “farmhouses” are in fact vacation homes, bed-and-breakfast inns, restaurants, and small factories built on farms across Taiwan. As a consequence, a large amount of land ideal for farming is being lost, a problem most pronounced in Yilan County, an agricultural area in northeastern Taiwan. In Yilan, the past 15 years have seen construction of 7,600 excess farm dwellings, taking up 1,900 hectares of farmland. However, even that definition is too loose, providing a loophole that enables real estate agents to take advantage of agricultural property deals, says Li Bao-lian from the NGO Guardians of Yilan. 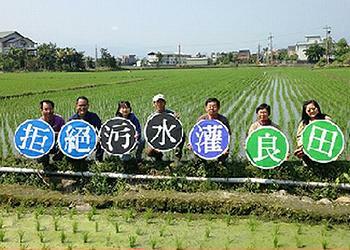 In 2014, more than 10 civil groups gathered on a rice field in Yilan to raise public awareness and call upon the government to address illegal farmland development. 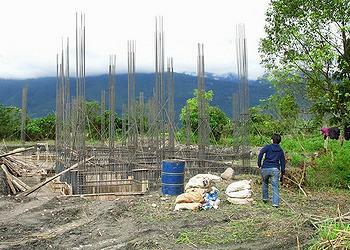 They warn that loss of farmland has damaged Taiwan’s food production base. Currently, Taiwan is only 33.3 percent self-sufficient in food supply, a lower rate than that of other countries. Japan, for instance, is 40 percent self-sufficient. Li Yu-jing, who comes from a farming family, says that when he finished school and wanted to start organic farming, most fields were left fallow. “Farmhouses are everywhere. There is very little land left for farming,” Li says. Once fertile farmland is used for housing and other developments, it becomes increasingly difficult to plow the soil and grow crops, worsening the threat of food shortage. Development also brings with it pollutants from household activities. Environmental groups fear that nitrogen and phosphorus from human waste, food, and certain soaps and detergents can pollute the waterways and compromise crops quality. Xu Nan-shan, director of the Yilan Irrigation Association, says a recent irrigation water quality investigation found 80 of 350 surface water samples with traces of heavy metals. Accumulation can affect food security, he says. Another unintended yet dangerous consequence of farmland development is the risk of flooding as impervious surfaces such as asphalt and concrete seal the soil surface, eliminating rainwater infiltration. The draft rules have been met with protests from real estate brokers, investors and the farmers who built or purchased luxury homes and are now under heavy selling pressure. Some legislators also worry that once the regulations are enacted, farmers burdened by loans will suffer due to fluctuations in agricultural land prices. Yet it is of great importance for the country to ensure sustainable agricultural development, says COA Minister Chen. He pledges to improve communication with the Cabinet and interest groups to push for implementation of the proposed regulations.